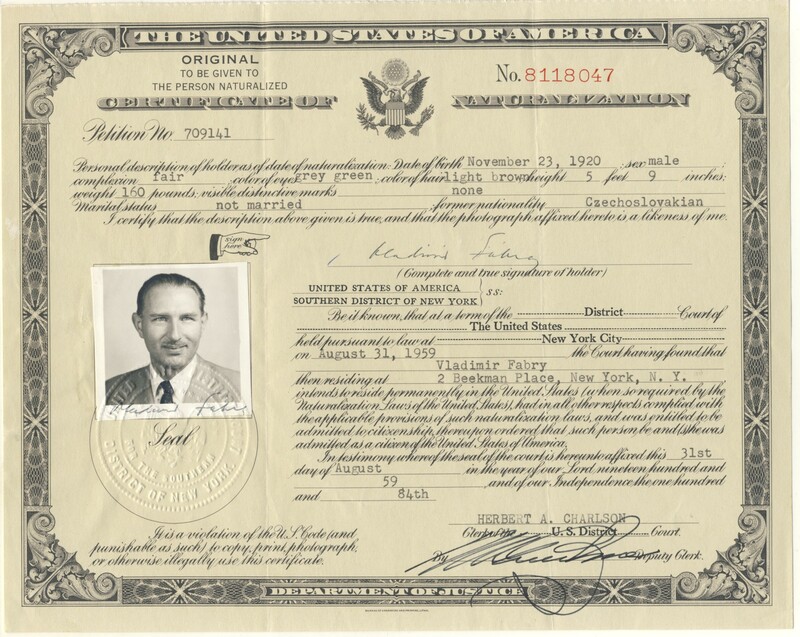 With the help of the 1951 UN Convention and Protocol Relating to the Status of Refugees (UNHCR), Vlado Fabry was eventually able to become a United States Citizen on August 31, 1959, but not without troubles along the way. 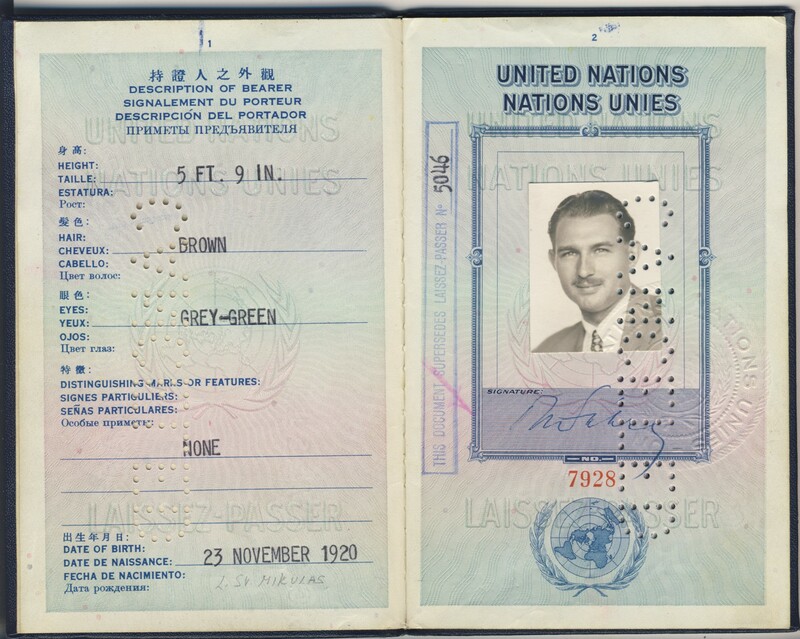 For one thing, it took a while before he had work at the UN in New York that kept him in the US for the required consecutive time period – he was called all over the world. But there was also trouble from the new Czechoslovak Government, who invalidated Vlado’s passport and asked the Secretary General to dismiss Vlado from the UN. I am not aware of ever having committed any crime or offense, in the United States or in any other country, except for minor traffic law violations. 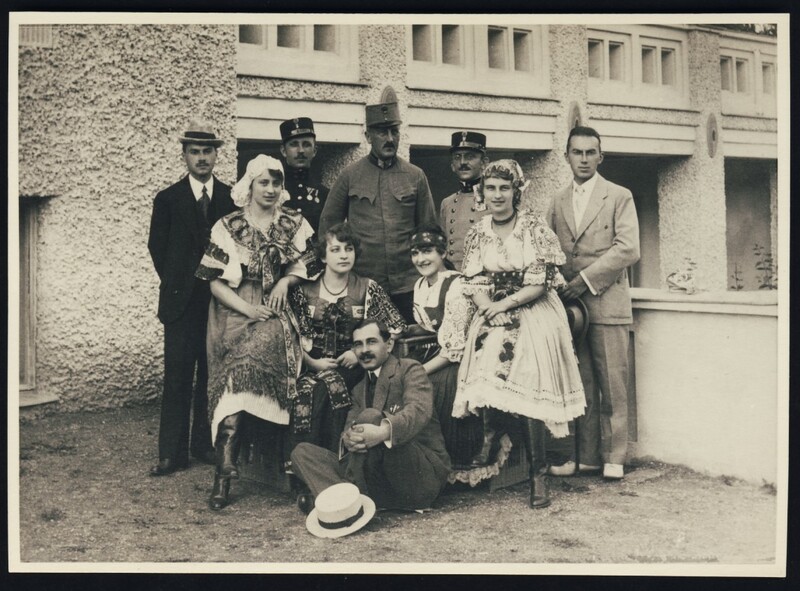 However, in October 1940, after having organized a mass walk-out of Slovak protestant students from a Nazi-sponsored organization called the Academic Hlinka Guard, I was arrested and without formal charge, trial or hearings of any kind condemned to deportation. On 27 January 1945, I was sentenced to death by the “Sicherheitsdienst”(Gestapo) for obstructing the German war effort and participation in the Slovak liberation movement against German occupation forces. 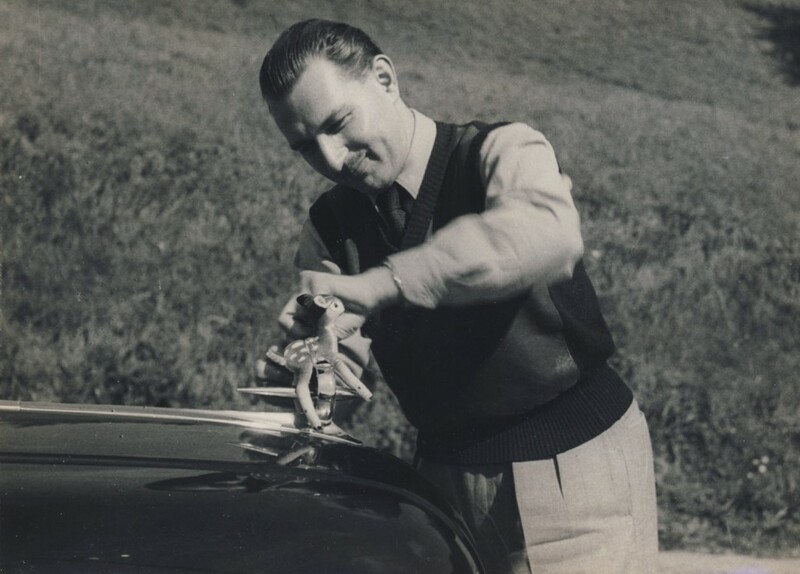 After the Communist Party seized power in Czechoslovakia, I was charged with “anti-state activities” for having expressed anti-Communist opinions and advocating freedom of private enterprise while employed as an official of the Czechoslovak Ministry of Commerce in 1945-6. As far as I know no formal trial was held on these charges, as I refused to return to Czechoslovakia when my passport was withdrawn and the Secretary-General did not deem it fit to comply with the request of the Czechoslovak Government for my dismissal from the United Nations service. Admission to the United States. On your request, I herewith submit to you the information which you may need to deal with the question of my admission to the United States. I was born on 23 November 1920 as a citizen of Czechoslovakia. I have been a member of the staff of the United Nations Secretariat since 15 June 1946, serving under an indeterminate (permanent) contract. I entered the United States for the first time on 15 June 1946 and was admitted under Section 3, paragraph 7, of the Immigration Act for the duration of my status as an International Organizations Alien. 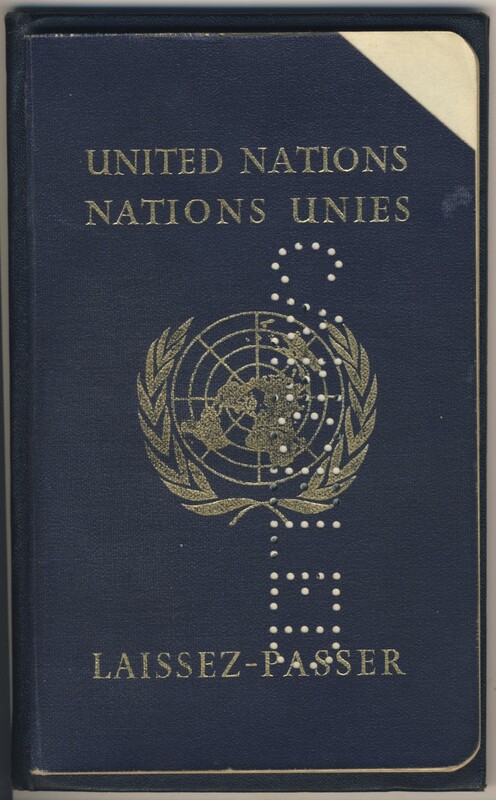 In April 1948 I left the United States on an official mission, re-entered the country on 6 January 1949 and left again on 15 February 1949 to serve with the United Nations Commission for Indonesia. After completion of my duties there, I was instructed to return to Headquarters for service with the Legal Department of the Secretariat in New York. As a consequence of my political convictions and activities, I became a displaced person after the communist coup d’état in Czechoslovakia in February 1948. The Czechoslovak Government has ceased to recognize the validity of my passport (No. Dipl. 2030/46). I drew the attention of the competent officer in the Department to this fact when I was leaving on my mission assignment, and I received the assurance that there would be no difficulty regarding my re-admission to the United States. This assurance had been given, I understand, after consultation with the State Department. I also explained my case to the United States Vice Consul in Djakarta, Indonesia, who was issuing my United States visa. He advised me that it was sufficient if I held my invalid passport as an identity paper, and that no difficulty would result from the fact that my visa was not stamped in a valid passport. Upon arrival at Idlewild Airport, New York, on 20 August 1951 (7:30 A.M.), I was told by the immigration officer on duty that I could not enter the United States. I was then requested to sign an agreement according to which I was released on parole. My passport and the Alien Registration Form on which the United States visa was stamped were taken away from me with the remark that my office should undertake further steps to regularize my status and affect the release of my documents. 1. I was notified by the United States Consulate-General in Zurich that a number on the DP immigration quota became available for me and that I should present myself at the consulate in Zurich before 27 May. 2. I should be grateful to receive permission to sign a waiver of United Nations privileges and immunities, which I understand to be a condition for the granting of a permanent residence visa. I trust that such permission will not be denied as it is essential for me, for the reasons indicated below, to acquire the right to establish a home somewhere. In view of the shortness of time given to me for appearance before the consular authorities, I should appreciate it if my request could be considered as urgent. 3. I should also like to apply for the permission to change my visa status without losing entitlement to tax reimbursement. The Report on Personnel Policy adopted by the Fifth Committee during the last session of the General Assembly states that the Secretary-General should be able to grant such permission in “exceptional and compelling circumstances”. In accordance with a statement made by the Chairman of the Advisory Committee on this subject, this provision relates to “certain officials of the Secretariat who had lost their nationality through no fault of their own and who might quite legitimately seek to acquire another”. I sincerely believe that these conditions are present in my case. 4. I have lost my nationality and I am unable to return to my country of origin because of substantiated fear of persecution on account of my political opinions and activities undertaken prior to my joining the United Nations. In the years 1945-1946, I was an active member of the Slovak Democratic Party which at that time was lawfully permitted and recognized as an instrument of the political will of the majority of the Slovak people; I also held the position of Assistant (Chef de Cabinet) to the Minister of Commerce. In accordance with my beliefs and official directives, I worked to the best of my ability on fostering the resumption of normal conditions under which trade could prosper, and on preventing the suppression by force of the right to enjoy private property and freedom of enterprise; such activity, lawful and constituting part of my official duties at the time it was undertaken, is considered criminal by the regime which since has come to power in my country. I was therefore compelled to become an expatriate, or else to make myself the object of grievous persecution. My fear of persecution is substantiated by the facts that members of my family and several of my friends had been arrested and interrogated regarding my activities; and that persons who held positions similar to mine, and did not escape abroad, were sentenced to long prison terms or maltreated to death. 5. Having thus without fault of my own lost my nationality, I consider myself legitimately entitled to seek to acquire the right to establish a permanent residence, a home, in another country. 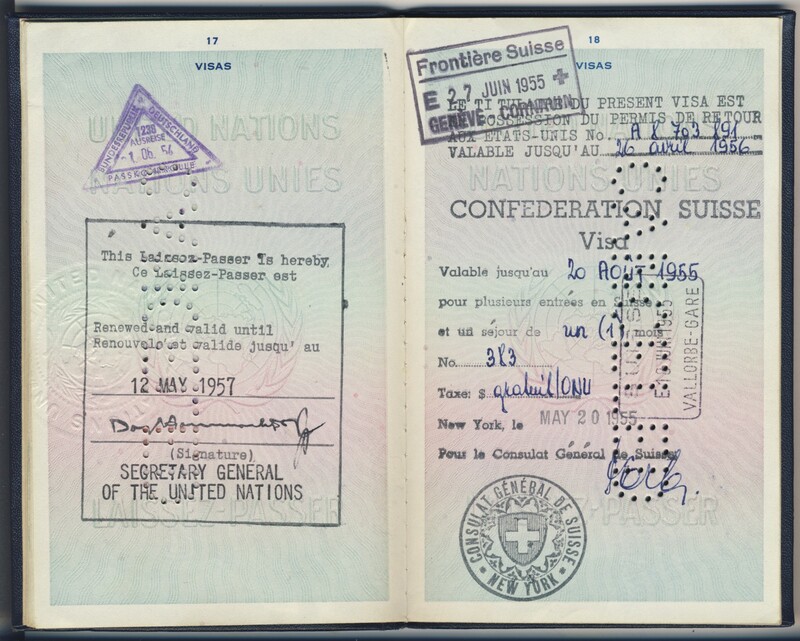 For although it is true that I have the right to stay in a country as long as I remain there in the United Nations service, I must provide for the possibility, which I hope shall not occur, that I might lose my present employment (and in any case, I shall need some place where I can reside after I reach the age limit). Moreover, being stateless and without the right to permanent residence anywhere, I am subject to many restrictions and deprivations. 6. I therefore firmly believe that I have compelling reasons for obtaining a visa status authorizing my permanent residence in the United States, and I hope that I shall be granted the permission to change my visa status without losing entitlement to tax reimbursement. I feel that it would be unjust if, having lost my nationality, I should be penalized for this misfortune by being made subject to financial burdens which I can ill afford. This entry was posted in Czechoslovakia, Dag Hammarskjold, Fabry Family History, Refugees, Trygve Lie, United Nations, Vladimir "Vlado" Fabry and tagged Citizenship, Communists, Czechoslovakia, Dag Hammarskjold, Genealogy, Hlinka Guard, Nazis, New York, political refugees, UNHCR, United Nations, Vladimir Fabry, Vlado Fabry on June 17, 2013 by fabryhistory. I was deeply shocked and saddened to learn of Vlado’s tragic loss. There are no words to express if fully, but I want you to understand that I am truly sorry, and pray that God is helping you to bear this heaviest of burdens. I did not know Vlado very well, but I think we were friends. We met, of course, through Olga in Geneva, where I studied in 1950-51. Vlado took me skiing in Vermont the following year, one weekend, and I remember how patient he was with my slowness as a somewhat permanent beginner! Then, he and Olga came to Washington, about two or three years ago, and came to see me in Virginia where I was then living. At that time, Vlado was already moving up rapidly at the United Nations. You must indeed be very proud of him for having achieved so much in a short time, and in spite of difficulties which would have discouraged most men. The account of his accomplishments portrays a life of dedication to high principles and of tireless efforts to put them into practice. The United States is the richer for having claimed him as a citizen, and the poorer for having lost him in the battle which we are all fighting. But his spirit and his example will be with us always. Forgive me if I have imposed on your sorrow with this long letter, but I wanted you to know my feelings. P.S. Please let me know if there is anything I can do for you. 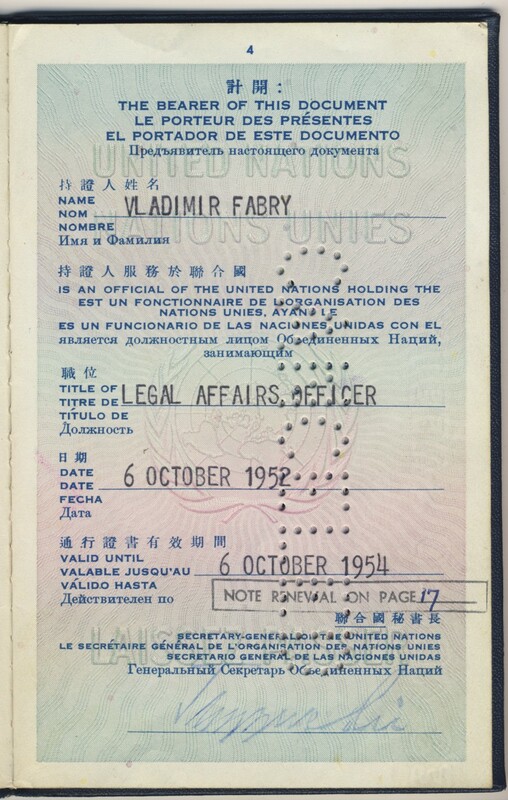 This entry was posted in Fabry Family History, United Nations, Vladimir "Vlado" Fabry and tagged Bambi, Ellis O. Briggs, family history, Genealogy, Geneva, history, Lucy T. Briggs, Olga Fabry, Switzerland, United Nations, Vladimir Fabry, Vlado Fabry on June 12, 2013 by fabryhistory. The United Nations Suez Canal Clearance Operation (UNSCO) was one of many missions that Vlado was involved with. Interesting items have been saved from this time, including a chart of the UN clearance operation schedule from January-April 1957; which shows the names of the tugs, salvage vessels and diver’s ships, with names like “Hermes and Wotan” and “Atlas”. It’s a very large chart, but I will post it here soon. I am afraid I shall be late with my rent this month but I left early last week for what was supposed to be a two days inspection trip into forward positions and what eventually turned out to be nine days out in the dessert (my spelling shows to you what is uppermost on my mind after a week of field rations). (And no USArmy rations, either Yugoslav or Indian, and neither of them go for fancy stuff). Anyhow, I eventually caught up with the pouch again, and the cheque is enclosed. Next time I better start thinking of the rent by midmonth. Most of my work here is on the problem of opening up the Suez Canal and I am thoroughly enjoying the technical side of it – I am getting to be quite an expert by now on sweeping wires, parbuckling, blowing up camels (although when I heard the term the first time I could not visualize anything else then the results of a faulty digestion of the local beasts of burden), patching and pumping, as well as on the even more complex problems of dredging maintenance, rehabilitation of workshops and floating equipment, signalling systems and traffic direction that must be solved before the Canal can be opened. Less pleasurable is the realization that notwithstanding all the efforts here and the good progress of the technical operations and negotiations on the local level, nothing will come out of it until the political issues are solved by the big boys. I also got caught up by some of the problems of the Emergency Forces, although that’s not really my job, and that was quite interesting too. I hope all is well with you – I think a bit wistfully of New England snow, this being my second skiing season that I am missing, but basking in a reliably constant sun is not too bad either, at least now while it is not too hot. But there is not much one can do for exercise – specially so as the office hours are 8am to 10pm, Monday through Sunday – and I see myself coming back as fat and flabby as King Farouk (or even worse so unless I find some suitable partner willing to engage with me in the one kind of exercise that he was practicing quite assiduously). If you should catch me off my guard and jump on me with the question “how long since you left New York”, I should quite sincerely answer that it was last week or so. I keep surprising myself each time i look at the calendar and realize how time has flown. One reason why all time conceptions become blurred may be our working hours arrangement – 8am (sic!) to 10pm, Monday through Sunday, not counting overtime -; with no weekends or even solitary Sundays to mark the full stop after another elapsed week one simply never knows that another week has begun. This having been said I am a bit at a loss what else I can write without getting at loggerheads with the UN staff rules concerning unauthorized release of confidential information. I can’t write about my private life – not only is there none but even if I had any I’m sure it would be classified as “restricted”,- everything else seems to be, including memos telling us what to do about fleas and bedbugs and summaries of news clipped from local papers. There are flocks of correspondents swarming around and of course all of them know perfectly well what we are doing and what’s going on, but still both at UNEF HQ and at the Canal Clearance Group I have to pretend as if I was an invisible man whom they could not possibly have seen emerging from a plane or car. Maybe the story about the secrecy class of documents marked as “to be destroyed before reading” was not an invention at all. In spite of everything, I am thoroughly enjoying life and the feeling of being in the middle of it, and I feel smug and happy whenever I get a chance to stop and realize how I feel or that I feel anything at all. I don’t know whether others feel the same when they wake up to it, but judging by the grumbling about tiredness, food, vermin, roads, dust, sleeplessness, cold, heat, dirt and everything else that one constantly hears around, I may be a blissful idiot completely unaware of the black doom around me. Of course one does get a bit discouraged from time to time when after beating for hours against a stone wall one finds the efforts rewarded by a small crack, only to come back the next day and find that the wall is as solid again as it ever was, but that’s all part of the job and is more than compensated by the absolute bliss when things do move ahead. And there is always the net profit on top of it – the new experience, in particular what I was able to pick up about the salvage and navigational aids business when working on the Canal clearance problems. Sorry for the long pause in my writing. You were just about due for a letter when things started crackling in Gaza, and what with the SG’s [Secretary General Hammarskjold] visit and the rush to finish clearing not only the physical but also political obstacles standing in the way of normal traffic through the Canal, this is the first time I have a free evening since nearly a month. But I don’t regret having been caught up in the madhouse of hectic rush and strain, far from it, I feel grateful for the chance to have been right at the focal point of world history for a while – although I would be a hypocrite not to admit the sigh of relief when Stavropolous OK-ed my actions and took over the responsibility. I always boast to be able to sleep a log in any circumstances, but there was a night when I tossed around tense with worry despite the fact that I had worked 39 hours without a break and should have been tired enough. I was the only lawyer on the spot, events moved so quickly that there was no time to set opinions into code and send them to headquarters for approval, actions were taken on papers dictated right in the typewriter without a chance to reread and revise them, and for a while I was left with the nightmare of figuring out ex-pot all that could go wrong instead of having a chance to think it over in advance. But we muddled through somehow. I admit that there were days when I did not think of you at all, or at most with a quick flash of recollection swamped away before the image could get proper hold, but I am making up for it now – I literally woke up with you on my thoughts the last three mornings and you stayed with me whenever my mind lazied away from work through the day and evening. Not much I can write about myself otherwise. I took an apartment (top floor, of course, to have an unobstructed view) with a big terrace and a contraption for beating out carpets on it that I planned to use for some chinning up exercises, but hardly made any use of it. Nor did I find time during the last month to go for my lunch-time swim and sunbath. I stayed in Cairo during the SG’s visit, but all the time could not find an hour for myself to look into a mosque or museum. And of course no time to read – although during the first month here I managed to pense books on Islam, on the pharaonic art and history, on 17th century philosophers, on Abelard, Graves’ Sargeant Lamb, Greens’ Heart of the Matter, Weller’s mediocre but for me interesting novel on “liberation” by the Russians, Dylan Thomas’ autobiography, Faulkner’s Unvanquished, a collection of Truman Capote and a few more. Hope to get a letter from you soon – never thought I would ask anybody to write me just for writing’s sake, but your letters are very precious to me and it feels so good to read and reread them (I got three so far). Let me know how your leg feels – will you be ready for some hikes when I come back? By the way, I shall leave here around the 20th or 25th April for Europe, reach NY probably beginning June. 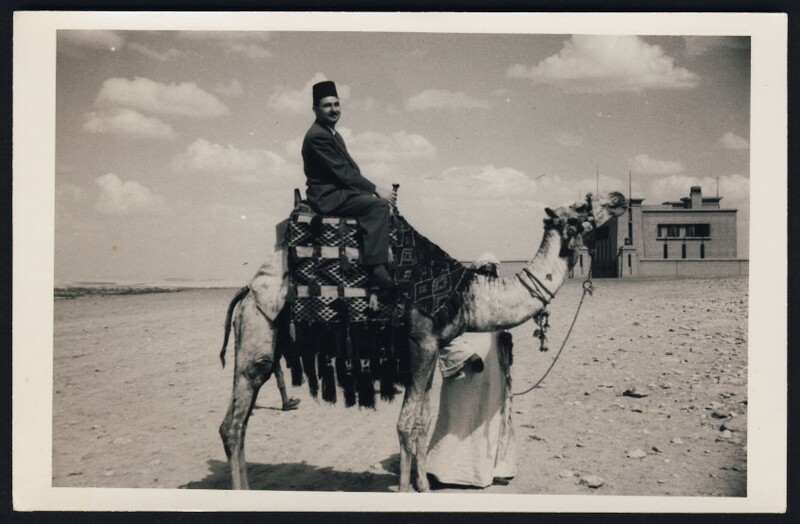 This entry was posted in Fabry Family History, United Nations, UNSCO, Vladimir "Vlado" Fabry and tagged Dag Hammarskjold, Egypt, family history, Genealogy, HammarskjoldProject, history, Ismailia, Mary Liz, Mary Sheila Dean Marshall, Suez Canal, United Nations, UNSCO, Vladimir Fabry, Vlado Fabry, William W. Crandall on June 10, 2013 by fabryhistory. 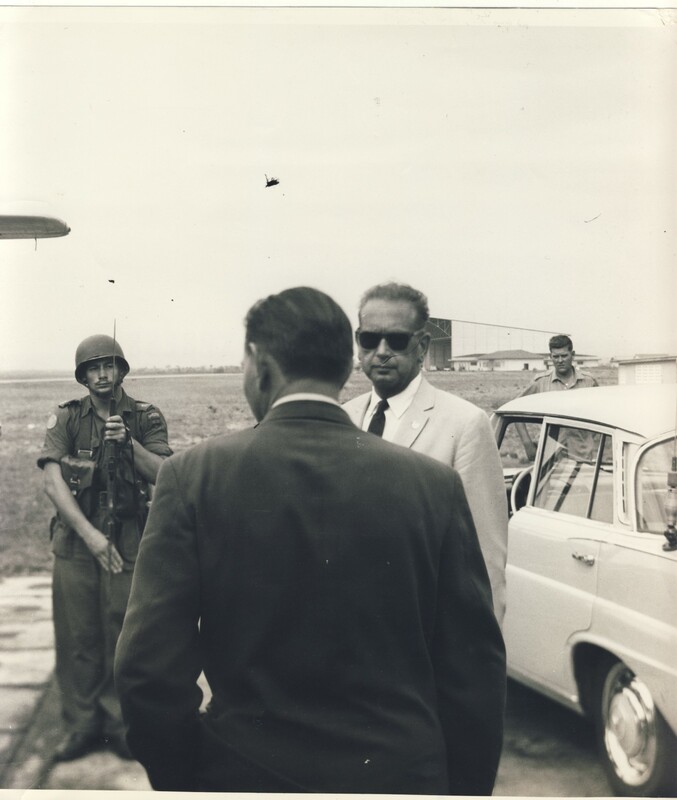 In my first post, I uploaded a video from Youtube by HammarskjoldProject, showing the final images of Dag Hammarskjöld and the UN members boarding the plane that would crash near Ndola, September 18, 1961. I’ve spent a good deal of time looking at images of Vlado and his most distinctive features are his ears, his broad smile and his high cheekbones, which is how I recognized him in the video, climbing the stairs for the last time. Here is one of the last known photos of Vlado and Hammarskjöld, taken by the Daily Express, which was sent with a condolence letter by Mary Sheila Dean Marshall from Ibadan, Nigeria. The photo is of the back of his head, but the ears are unmistakably Vlado’s. The letter, and the obituary of Marshall that galvanized me to begin my research about Vlado, is posted here. **Update: This photo was cropped. The expanded photo and more is included in later posts, found here and here. This entry was posted in Dag Hammarskjold, Fabry Family History, United Nations, Vladimir "Vlado" Fabry and tagged Africa, Dag Hammarskjold, family history, Genealogy, HammarskjoldProject, history, Ibadan, Mary Sheila Dean Marshall, Ndola, Nigeria, Northern Rhodesia, Slovak history, United Nations, Vladimir Fabry, Vlado Fabry on June 2, 2013 by fabryhistory.